When it comes to graphical options in PC games there are several things that most PC gamers have came to expect from AAA titles, proper anti-aliasing and Anisotropic filtering options, both of which Gears of War: Ultimate Edition Lacks. The best way that the graphical options menu can be described in Gear of War: Ultimate Edition in functional, not what any PC gamer would be calling Ultimate. When it comes to AA options the game has AA off or FXAA, which is simply not good enough considering how much some PC gamers despise FXAA, as it decreases aliasing at the cost of having a blurry final image. An AA option like SMAA would greatly add to the game, reducing aliasing without the blur effect of FXAA, which is something that most PC gamers will agree is worth the performance cost. When looking at the other graphical options there is very little to talk about, you can turn motion blur and ambient occlusion on and off and change the details of shadows, textures and some visual effects, which are the most basic of graphical options. 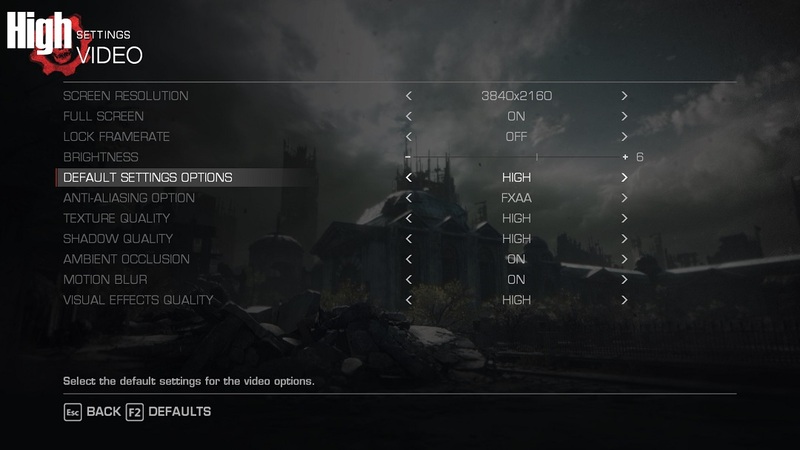 Just to make a point I had a look at the graphical options menu if the original Gears of War game for the PC, the game that this is the "remastered" from. Here we found that the original version on PC had a much more detailed graphical options menu and had full Anti-Aliasing options, meaning that the Graphical Options Menu in this "Ultimate Edition" has actually gotten a downgrade. When testing this game we benchmarked the game with the games 4 graphical presets, lowest, low, medium and high. In the following pages we have also done a 4K screenshot comparison of these setting to highlight the differences.